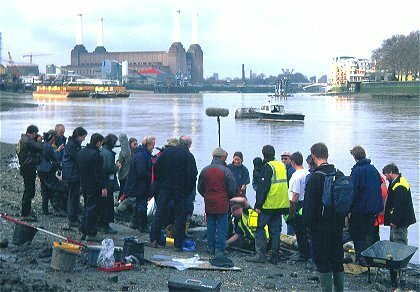 With the sad news announced this week that Time Team on Channel 4 is no more, here at TDP Towers, we’ve been indulging in a few reruns on Youtube and 4oD, and remembering some of Time Team’s finest moments on the River Thames foreshore. Most recently, the 47th Time Team Special was all about the launch of the SS Great Eastern. 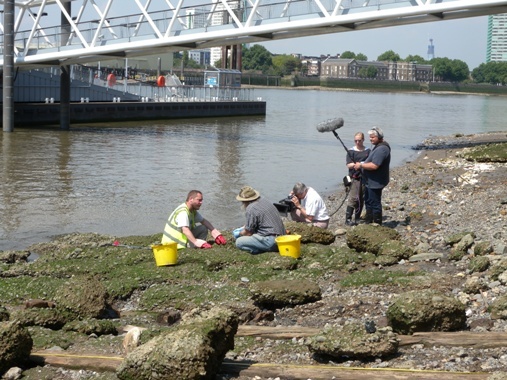 The programme featured the Foreshore Recording and Observation Group in action on the foreshore at Burrell’s Wharf together with Museum of London Archaeology’s Geomatics team. The episode was broadcast in November 2011, and was watched by an audience of 1.5 million viewers. To watch the programme online click here. 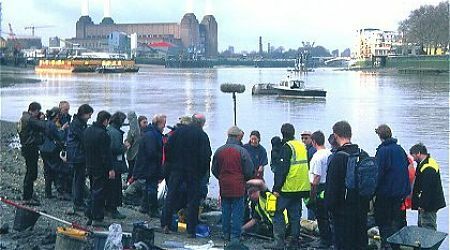 In 2001, the first episode of Series 9 (broadcast 2002) was filmed on the Vauxhall foreshore – where the remains of a Bronze Age bridge or jetty had been recorded by the Thames Archaeological Survey during the 1990s. You can see the timber excavated during the filming in the London before London gallery at the Museum of London, and watch the episode online here. 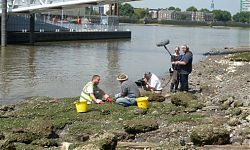 With locations including Southwark Cathedral’s tower, and excavations in the grounds of Lambeth Palace, this early episode of Time Team (Series 2, Episode 4) featured augering, historic maps, geophysics, boats, a helicopter, jellied eels, surveying with a brick, and a host of well-known London archaeologists, including our very own Gustav Milne! The episode was filmed in 1994 and you can see it on Youtube here.